I picked up my next transfer car which would take me from Christchurch to Picton. 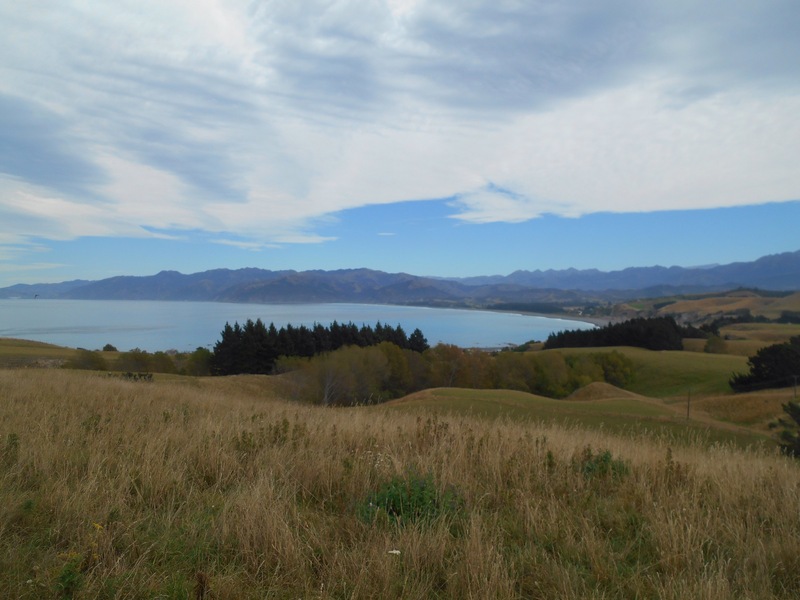 The road north was uneventful until it began following the coastline just outside Kaikoura. In amongst the craggy shoreline, I quickly spotted a pod of dolphins playing and pulled over to watch them leaping from the water playfully. Between rail tracks on one side and the ocean on the other, the road wound along the waters edge and into Kaikoura where I climbed to a viewpoint. The town is on a small peninsula so from the vantage point I could see the ocean on both left and right, the small parade of the towns shops to the right. Down in the town I explored the many souvenir shops all displaying Paua shell and greenstone jewellery, then took a picnic to the gravelly beach to scan the horizon for whales or Dolphins. Kaikoura is a Mecca for whale watching with the nutrients of the shoreline bringing them up from the depths of the ocean floor nearby. After a warm afternoon I returned to my friendly hostel and quickly a group of us were chatting, sharing travel stories and realising friends in common. The afternoon turned into evening and the hostel was hosting a barbecue which preempted a relaxed evening of drinks and games. Having enjoyed the group dynamics so much the night before, I abandoned my days plans to join George, Alex, Lis and Peter to Hanmer Springs Thermal Hot Pools a few hours inland. The Boys relaxed approach contrasted the motherly impatience of Lis and with many mistranslations and singalongs thrown in, it was a fun day out. The hot pools sits on a natural thermal area which has been made into a complex of different hot pools, sulphurs pools, a lazy river and jacuzzi. We also tried out the flumes, the most fun being taking the inflates on a flume which then turned into a sink which you whirled around before dropping down the plug hole any which way. 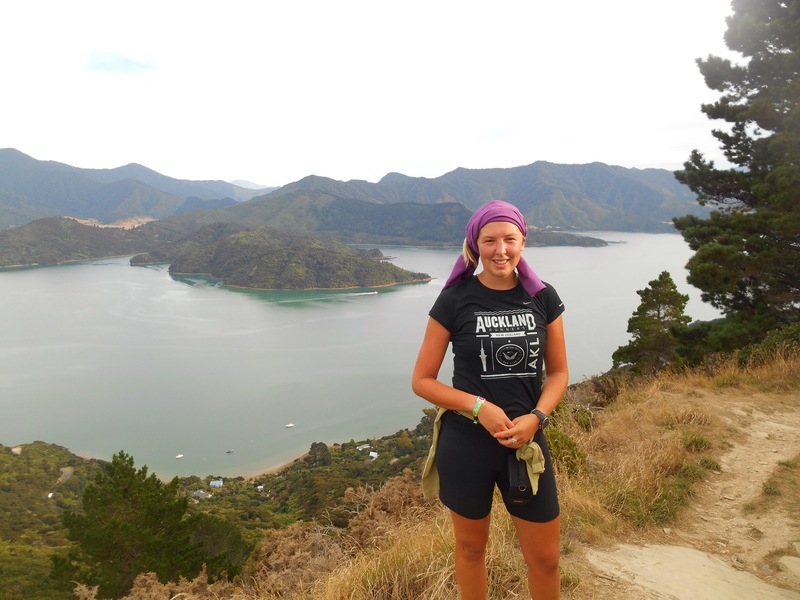 After the journey back to Kaikoura, I continued on up the coast to Picton. The sun was just scorching the clouds a beautiful red as I pulled into the port town at dusk. 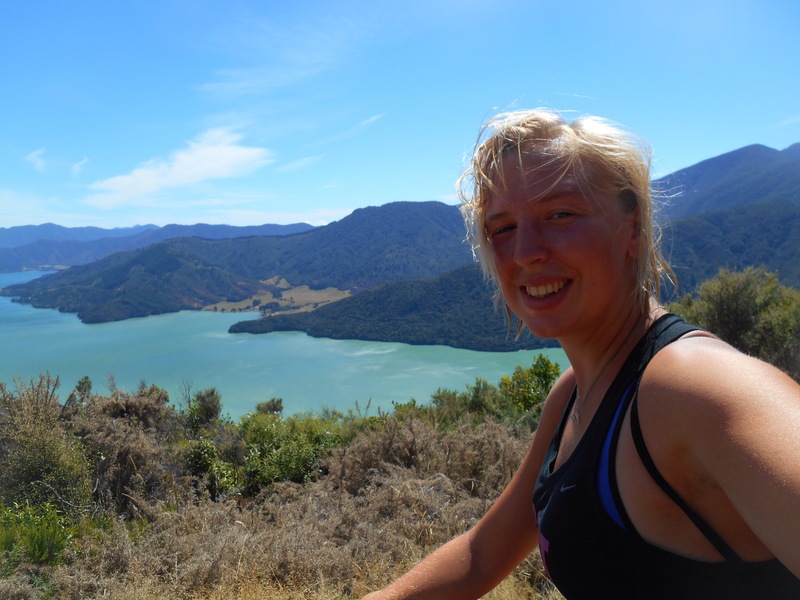 In the morning it was time to start the Queen Charlotte Track. I dropped the rental car back and made for the foreshore to catch the 9am boat. We cruised along through the frond like sounds, this time actual river formed sounds unlike the misnamed Milford Sounds. 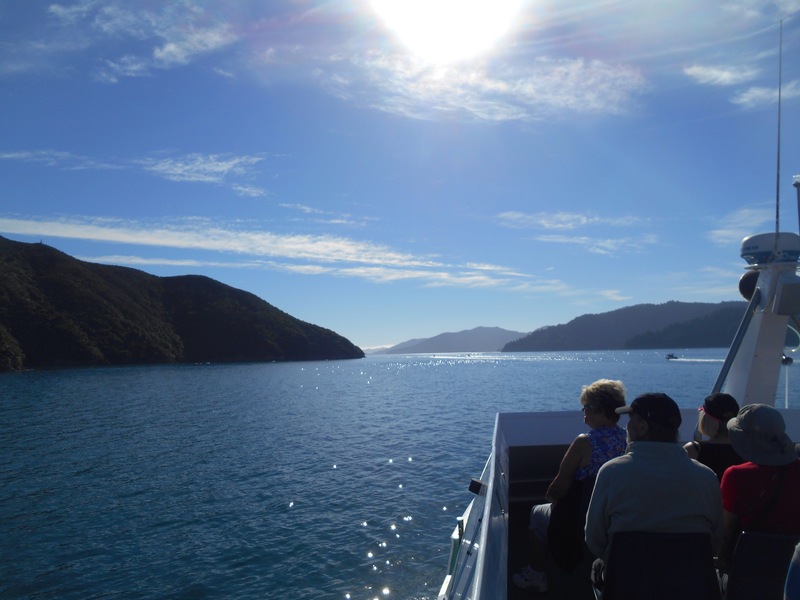 The Marlborough Sounds part of New Zealand’s coastline makes up a staggering 20% of New Zealand’s coastline. At one point the captain pointed out that to get to the other side of the frond would be 2km by road, but 150km by boat to go out to see and return on the other side. We pulled in at several inlets dropping and collecting luggage, having a running commentary of the real estate prices and the birdlife. Many of the sounds are completely cut off from land so have been used to reintroduce endangered birdlife. Rare kiwi, South Island saddlebacks and Kakariki inhabit and flourish in isolation. 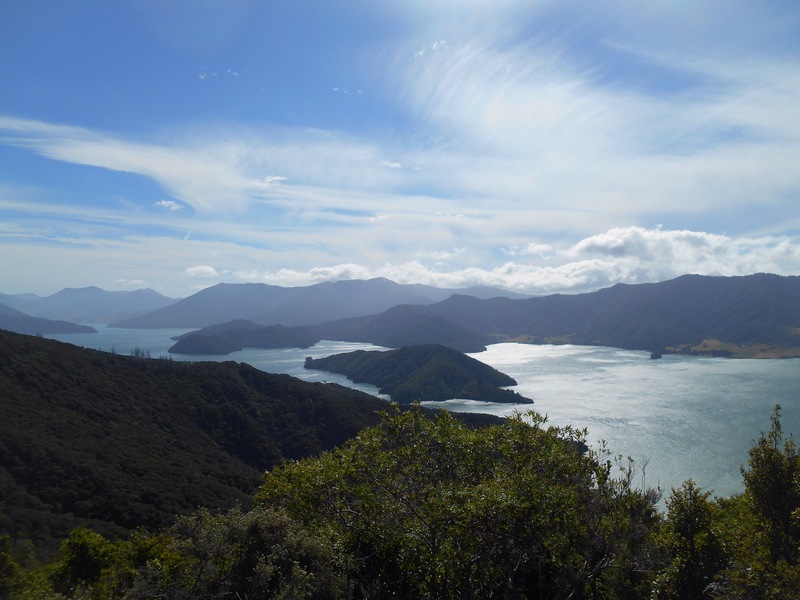 Captain James Cook visited the Marlborough sounds 5 times over his lifetime. 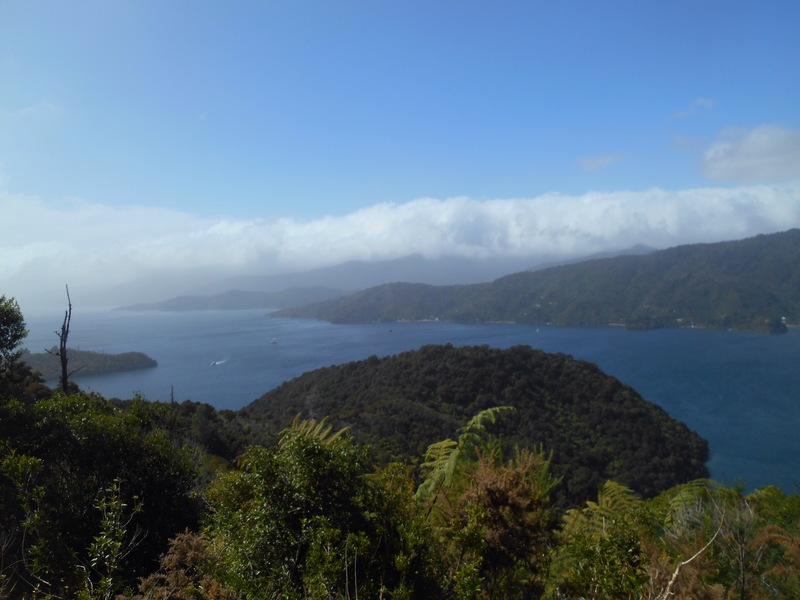 Motueta island, now a bird sanctuary, was where he sunk his flag declaring New Zealand for the Brits. The Maori people have creation stories for the geography of New Zealand. The South Island, the Demi God, Maui’s canoe, the north island his fish, the mountains and rivers carved out through wars and fighting. Kupe is said to be the discoverer of the land, the first to come over from Hawaii. 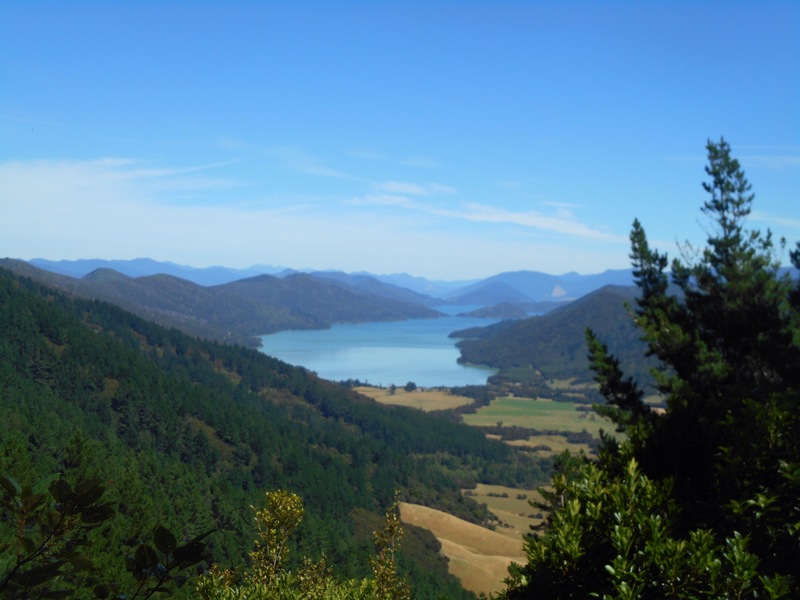 Marlborough Sound was formed as he fought and struggled with an Octopus, pulling it and the land up from the Ocean floor. It’s long, thin peninsulas certainly look like the tentacles of a sea creature, sprawled in each direction. 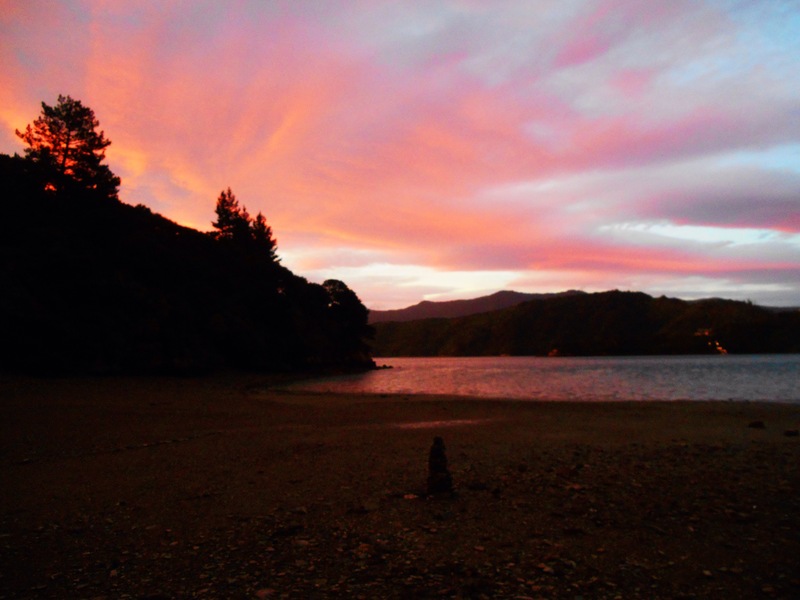 We continued out to almost enter the Cook Strait, the water almost without ripples. 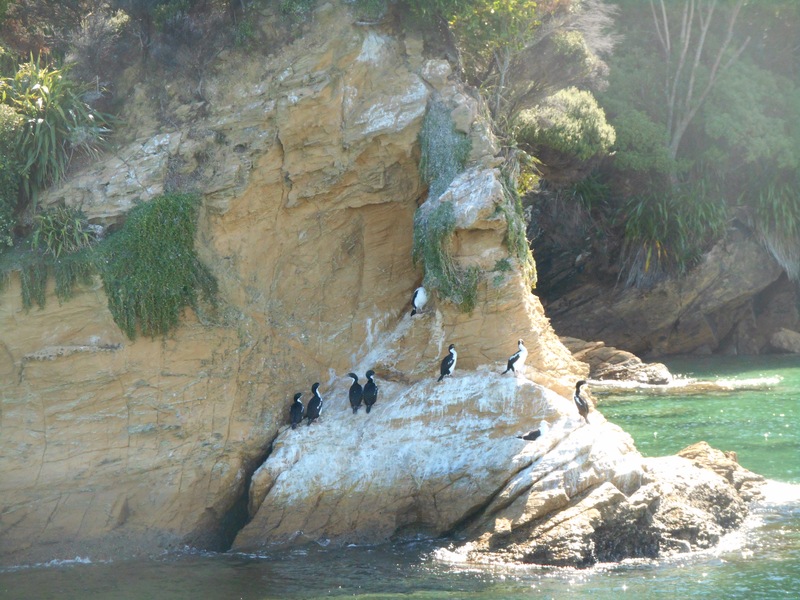 Here is the only place inhabited by the King Shag, their one rocky outcrop their nighttime base after fishing in the water. We saw many times the swimming figure of the bird then diving down for his catch. 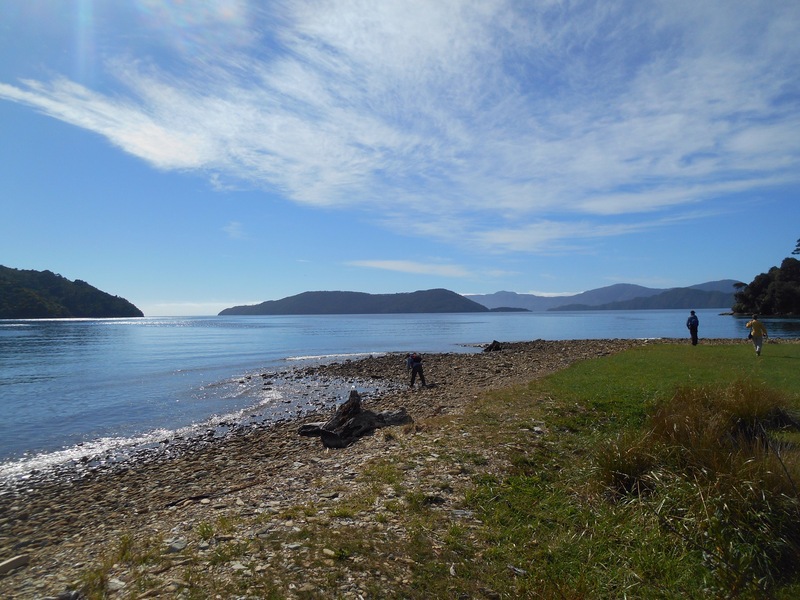 At Ship Cove we disembarked to explore the bay where Captain Cook made base during his expeditions, taking to watertighting, cleaning or repairing the fleet. He had established a vegetable garden here and even introduced goats and pigs which were eaten by the men before they had a chance to breed. 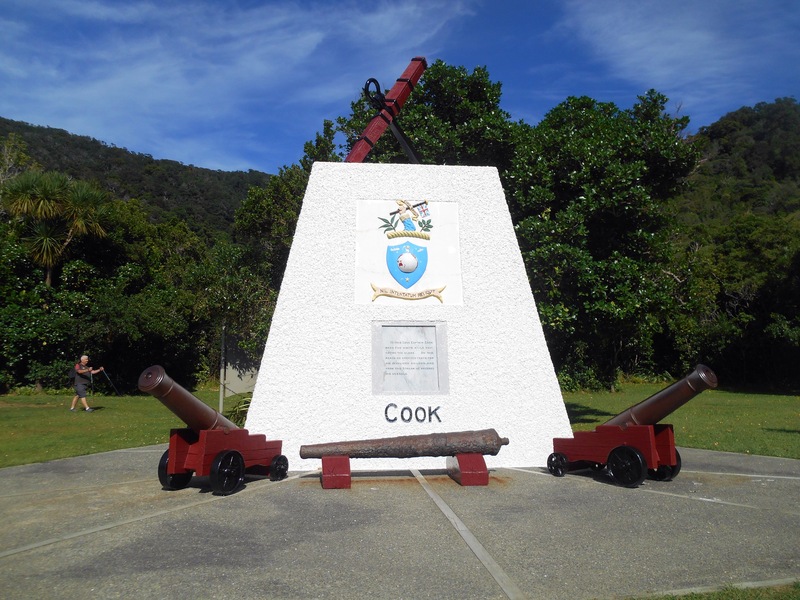 There is a memorial to Captain Cook and his five visits, established after his death in Hawaii. There is a cannon from his voyage which was offloaded in the Great Barrier Reef in Australia after his boat ran ashore and needed to lose weight. The bay is beautifully maintained and the start of the 71km track back to Anikiwa. 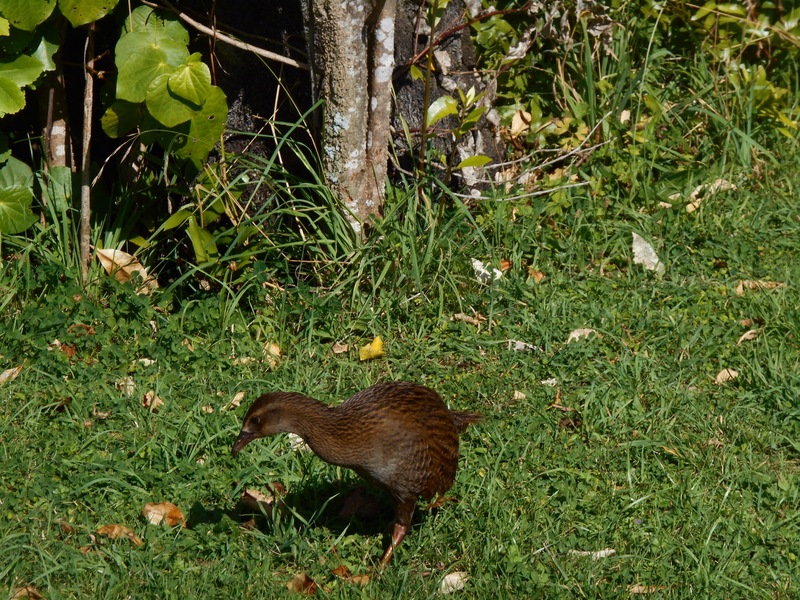 It was here I saw my first Weka, another opportune bird, although not quite as cheeky as the Kea. I was to start the track at Camps Bay so to finish it in two days. We traversed back into the sounds and finally, just before 12pm I was dropped at my starting point. I had 24km to complete, a recommended 8 hours before I met my luggage at Portage Bay, so I powered up out of the inlet, quickly drenched with sweat. 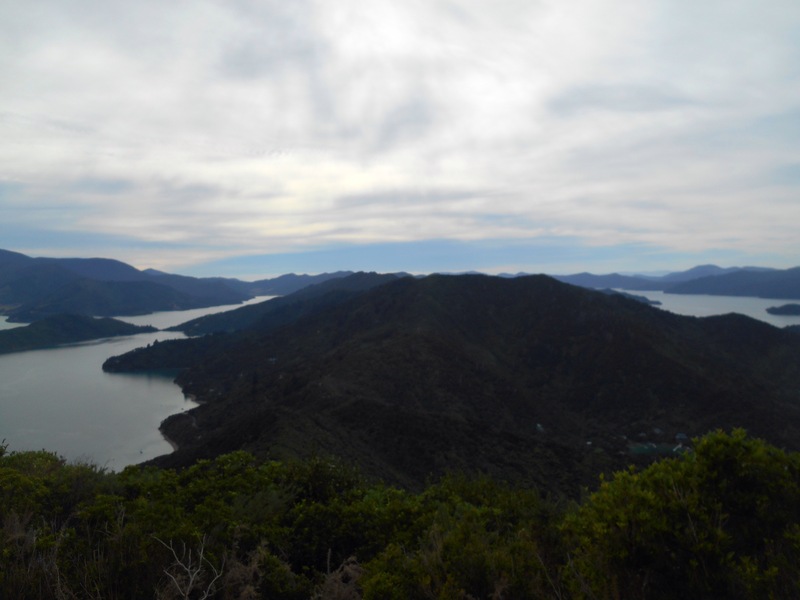 The walk was along the ridge of the mountain, dropping away each side, to the left, Queen Charlotte sound, to the right, Keplorus Sound. The calm water giving way to greenish, blue hues of the mountains beyond, not a cloud in the sky. I heard, and then saw, a noisy group of mountain goats, one with the most impressive beard I have seen on man or beast. Later in the afternoon I caught up with a couple and spent the next hour or so walking with them until a break in the Black Rock shelter. After a short refuelling stop, I pressed on so as to not stiffen up, and made camp in great time, about 5pm. I collected the bags from the boat transfer and put up the tent before braving the icy shower. Despite the fact the drinking water had warmed in the pipes, the shower water remained bracingly cold. It was a relaxed environment around camp that night and a chance to swap stories with fellow campers. The presence of possums in camp had cost many others their sandwiches and it was with amusement we discovered that they had a taste for sourdough over budget bread. The next morning everyone was keen to get away early. With 20kms to go before 3:30pm return shuttle, my neighbours were packing up before 7am. I was on route by 8 and yet it was still a hot and steep start to the day. I tied my other layer around my head looking like an obscure pirate. Once again, the views were incredible, every gap in the undergrowth stopping to take a photo and realising they all looked remarkably similar. 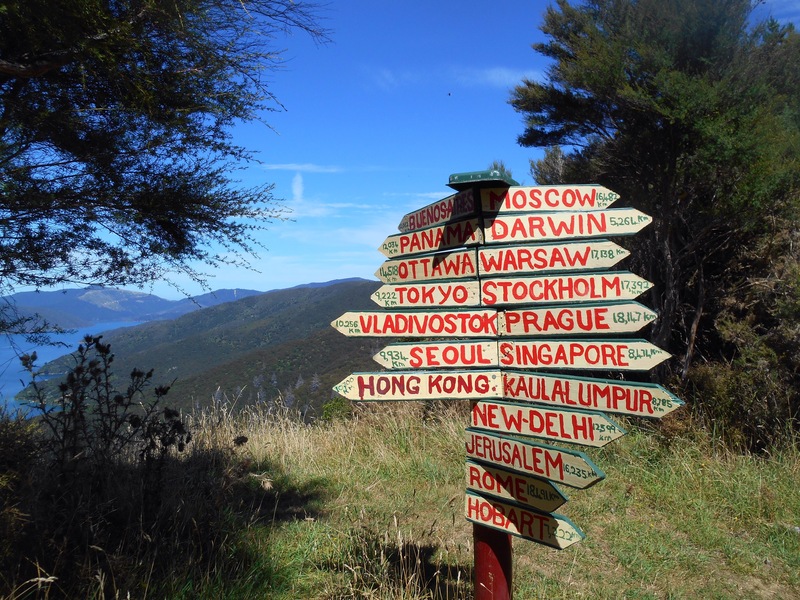 I took a detour climb up to a hilltop viewpoint, which gave incredible 360 degree panorama of the surroundings. At the top I met a Dutch guy, Lars, and realising we were a good pace match, or him a little faster, we walked the rest of the walk together, eventually coming off the ridge and around the bay’s into Anikiwa. Of course the last kilometre felt the longest. As we sat in the small bay waiting for our shuttle, other hikers crossing the finish line, the clouds and mist cooled the air. We were all almost asleep on the transfer back to Picton. After a few hours downtime in the evening, Cristina, Helen, Lars and I all met to cook dinner together. As my last night in the South Island, I was sad to be parting as everyone was just beginning their adventures, but of course excited for my return journey to Auckland. Previous You shall not [Arthur’s] Pass! The outstanding natural beauty comes across clearly and your photos show that too. It seems to be a land protected by its remoteness. I am excited that I will see some of it with you next year.